Copyright � 2001, The Staten Island Advance. As love stories go, the tale of Joseph (Joey) and Linda Maffeo was the kind of romance found in storybooks set in far off places. It is a story that Mrs. Maffeo is saving for Christopher, 1, whose smile would send his father racing home to Grant City after work. Mr. Maffeo was a party guy who turned into a prince almost overnight, trading in his share of a fishing boat he owned with pals for a diamond ring, without trading in their friendship. Few people took him for the type to leave fresh daisies in his wife's car, or make her a jigsaw puzzle from a photo of lovers sharing a kiss. But the former Linda Dornes saw his potential from the day he got up the courage to walk into the bank where she worked and ask her out. "I never gave my number out to customers, but he had the gentlest eyes I had ever seen," Mrs. Maffeo recalled. 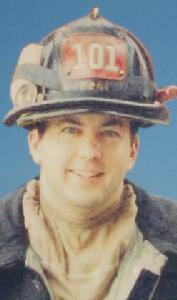 Those gentle eyes saw a lot of heartache since being called to the New York City Fire Department in 1996. But the firefighter loved his wife, loved his life and tomorrow was always a new day, until Sept. 11. 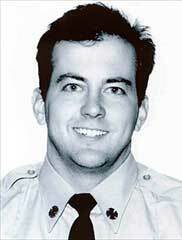 Mr. Maffeo chose to work a 24-hour overtime shift the day before, and was still on duty when Ladder Co. 101 in Brooklyn got the call that two hijacked airplanes had hit the World Trade Center. The Twin Towers collapsed less than two hours later, and Mr. Maffeo went missing in the rubble. Rumor had it that all of the firefighters from Ladder 101 returned from the collapse, but Mrs. Maffeo, who was in Florida visiting her mother, knew it couldn't be true. Her husband would have called. Mr. Maffeo was 30 years old. Born in Rosebank, Mr. Maffeo grew up in New Dorp, where he forged a friendship with T.J. Beinert and Bobby Melloy that those closest to the trio say bordered on the bizarre. Not that the boyhood chums were individually strange, but that they could stand to be together so often boggled minds. It got so people outside the clique, known as "The Three Musketeers," couldn't place one without the other two. "People would ask, 'Who's T.J.?' And someone else would have to say, 'You know, T.J., from T.J., Bobby, Joey,'" Mr. Beinert said. "He was a friend to us for so long that we don't have any memories of our lives without him." One that sticks out is of them as teen-agers, when Mr. Melloy got his hands on an old Cadillac from a relative. The Musketeers thought it would look better as a convertible and proceeded to saw the roof off so they could tool around town in style. Mr. Beinert remembers trying to talk Mr. Maffeo out of selling his share of the trio's fishing boat, appropriately named "Lucky Me III," to buy an engagement ring. There was no stopping him. Mr. and Mrs. Maffeo were married in 1998, and Christopher was born last year. The family moved to Grant City in June. The Musketeers always figured they would raise their families together. Now, they and Mr. Maffeo's colleagues at the firehouse are compiling a scrapbook of memories so Christopher will be able to know the man his father was. Mr. Maffeo was a graduate of Staten Island Technical High School. He went on to earn a degree in applied science from Delhi College of Technology in 1992, and graduated with a bachelor's degree in geographical information and spatial analysis from the State University of New York at Albany in 1994. When he wasn't fighting fires, he was building houses with his brother-in-law, Edward Morri, or spending time with his family. There was nothing that excited Mr. Maffeo more than pulling his beat-up pickup truck into the driveway to find his wife and son waiting for him at the door. "I never thought he could love anyone more than me, but there was even more love for his son," Mrs. Maffeo said. "He just beamed when he saw him." Mr. Maffeo spent hours piling building blocks with his infant son and was looking forward to watching him come of age. At the time he went missing, Mr. Maffeo was studying to become a lieutenant in the Fire Department so his son and wife might have a better life. Mr. Maffeo had a knack for working with wood, and enjoyed scuba diving with his wife on annual vacations to the Caribbean islands. He also looked forward to spending each Fourth of July camping with the families of Mr. Beinert and Mr. Melloy. But Mr. Maffeo's most admirable trait was his ability to juggle a family, friends and two jobs without anyone he loved feeling left out. In addition to his wife, Linda, and his son, Christopher, surviving are his parents, Louis and Jean Maffeo, and four sisters, Donna Maffeo, Susan Drury, Linda Manfredi and Debra Morri. There will be a memorial mass on Monday at 11 a.m. in Our Lady Queen of Peace R.C. Church, New Dorp. The arrangements are being handled by the Hanley Funeral Home, also New Dorp.